It would be wrong to say that financial markets aren’t always made up of lots of moving parts but it’s also fair to say that the early post-GFC years saw many of these moving parts drowned out by the powerful Quantitative Easing (QE) programmes employed by major central banks. During the more recent period of QE reversal, led principally by the US, where the Federal Reserve has been reducing its holdings of US Treasuries, there has been a notable increase in the market relevance of some of these moving parts. Taking this one step further, it’s a brave person that argues there is no link between Quantitative Tightening (QT) and the more difficult environment we have seen for financial assets of late. So let’s take a closer look at some of these moving parts. Taking the macro environment first, the data is increasingly painting a picture of a growth slowdown. For most of last year, many of the manufacturing surveys had suggested that growth in the major economies outside the US had been slowing but that the US had proved more resilient. 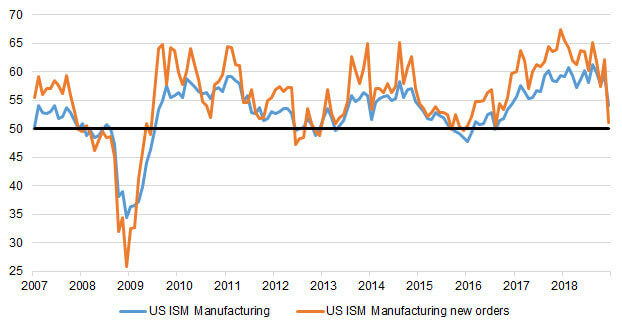 However, the graph below shows how the well-regarded ISM US Manufacturing survey has recently pulled back sharply from its highs (where below 50 is consistent with contraction). We shouldn’t put too much faith in one data point but if we look at the ISM US Manufacturing new orders survey, the ‘leading indicator of the leading indicator’, it shows a more prolonged and material decline. Source: Bloomberg, 31/01/2007 – 31/12/2018. To dispute the slowdown would seem unwise but to extrapolate it to recession seems premature and maybe unnecessary, as a material slowdown will have enough of a market impact to make it very relevant. Indeed, the global slowdown has been increasingly priced into markets throughout last year: defensive equity has outperformed economically sensitive equity and US Treasuries have outperformed US corporate bonds. Indeed, credit spreads widened materially in the last two months of 2018. More recently, from a bottom up perspective, Apple lowered its revenue guidance on weak Chinese sales, adding to concerns about a global slowdown, while the forthcoming fourth quarter earnings season will provide further insight into the health of corporates. Against the backdrop of sharply lower equity markets and broader concerns of a slowdown, it has been a fascinating few weeks for the US Federal Reserve and what they have been communicating to the market. In December, Fed chair Powell noted that the reduction of the Fed balance sheet was on “auto-pilot”, but fast forward to early January and he has been bending over backwards to stress that policy is flexible, including messaging such as, “we’re listening with sensitivity to the messages that markets are sending”. He clarified that this flexibility extends to QT as well as interest rates. This might remind those old enough of the “Greenspan put”, though it’s probably too early to assume a “Powell put” is in place. While the debate will no doubt rage on as to what these words mean in practice, the Fed is surely right to consider the tightness of financial conditions and their impact on the real economy, as they are right to emphasise that they are flexible in how they react to the data environment. The surprise was the quick change in tone. Looking more broadly at policy, political leaders are likely to continue to play a dominant role in financial markets, with quite binary outcomes likely, whether it’s Brexit, or US-China trade, or the US shut down. We are reluctant to position for this, beyond trying to ensure we don’t have too much exposure to binary outcomes either way. There is a chance that, just as the weaker macro environment and tighter financial conditions in the US has led to more flexible sounding US central bank, we might get a more flexible sounding US president. Across asset classes, we are fairly cautious, with lower than normal exposure to equity and higher than normal exposure to gold. In bonds we remain reluctant to take too much risk, whether it’s in credit or duration and in property we have a small, geographically diversified exposure. In summary, whether or not we are returning to the old days of bad (macro) news meaning good (policy) news, it is too early to call, or indeed whether Fed policy drowns out most of the other moving parts again. That debate will continue, as will the debate as to whether it will be a soft or hard landing. As ever, we value the liquidity of our positions highly so that, in the event of a material change in the data environment, we can react quickly. At first sight, the change in Fed tone is not to be taken lightly. Source for information: Miton as at 08/01/2019 unless otherwise stated.